Longleat held a Hillclimb event every year until recently, with many classes of car present. The track is on part of the estate roads with a simple but narrow and tricky route. The track has been created from scratch from the authors knowledge of the location. It is an open ended circuit and the time for the run starts when the 'timing' beam is broken at the start and finishes in the same way on the run up to the top paddock. 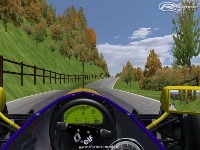 It is suited to hillclimbing only and is too narrow for wheel to wheel racing. v1.02 fixed installation folder problem causing sky error, and improved framerate. Please uninstall previous version before installing this one. There are currently no setups for Longleat Hillclimb. Add a Setup. Downloaded the latest version. Still hangs on the loading screen and CTD if you get fed up and press Enter. Tried several times now but I give up. Hope you can come up with something that works Greg. Keep at it. I've tried 3 installations on my own test machines and they all work fine - I suggest you manually remove all traces of previous installations before reinstalling the latest version. I'm getting "File temporarily unavailable"
New installation file uploaded. Fixed installation folder and improved framerate. New to this track building so feedback very welcome when constructive. Still working on this track but wanted to make it available for folks to try.